Has it really been almost 25 years since Star Wars burst into our lives? Its characters have become part of our pop culture. Its terminology has become part of our language. Its themes are evocations of our mythology and stereotypes, told within the framework of that most innocuous of vehicles: the movie serial. It is one of the triumphs of The Phantom Menace for its creator, George Lucas, that the essence and spirit of Star Wars is captured both in theme and action. We can make the associations between Anakin and Luke Skywalker, so there is a gripping sense of suspense in imagining what can unfold in Episodes II and III, leading into the events portrayed in the second trilogy. This first episode in the Star Wars saga begins with two Jedi Knights, Qui-Jon Jinn (Liam Neeson) and Obi-Wan Kenobi (Ewan MacGregor), sent by the Republic's Supreme Chancellor Valorum (Terence Stamp in a cameo—at least in this episode) to mediate a dispute between the Trade Federation and the planet Naboo. Betrayal immediately ensues as the Trade Federation, controlled by the Sith Lord, Darth Sidious, attempts to kill the Jedi and launch an invasion of the planet Naboo. Qui-Jon and Obi-Wan escape to Naboo where they encounter Jar Jar Binks (Ahmed Best), who helps them make contact with a hidden underwater civilization, who in turn, aid them in reaching the government, headed by Queen Amidala (Natalie Portman). Rescuing the Queen from the clutches of the Trade Federation, the Jedi attempt to take her to Coruscant, the central system of the Republic. When their ship (a far cry from the Millennium Falcon), is damaged in the escape, it is only through the efforts of a fearless astrodroid that their power supply is repaired, just enough to get them to the Outer Rim planet of Tatooine, which is controlled by the Hutt. While on Tatooine, Qui-Jon takes Jar Jar, R2D2 and the queen's handmaiden, Padme, into the city in search of parts to repair the ship. Oh, that fearless droid? R2D2, of course. 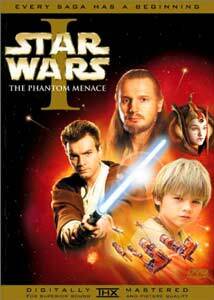 In a fateful encounter, Qui-Jon meets Anakin Skywalker (Jake Lloyd), in whom he strongly senses the mysterious Force. Young Skywalker has built his own protocol droid named 3-CPO (Anthony Daniels) and turns out to be an experienced pilot in a local sport called pod racing. Qui-Jon eventually joins Anakin in a plan to sponsor the youngster in a race in order to win the money necessary to fix his own beleaguered ship. Although the boy has never completed a race, Qui-Jon is confident that he will win. The Force? You bet. Of course, we know that this Anakin Skywalker is, some decades later, to become Darth Vader, evil servant of the Empire to come, and deadly enemy of his own son, Luke Skywalker. So when Qui-Jon determines that Anakin has an impossibly high midi-chlorian count, he takes the boy to be trained as a Jedi Knight. Midi-chlorians, you ask? These are living creatures that thrive symbiotically in all living things and is the source of what the Jedi know about the Force. Oh, those midi-chlorians. The story becomes much more involving from this point on, including interactions with the Jedi Council, headed up by the venerable Yoda (Frank Oz), Mace Windu (Samuel L. Jackson), Senator Palpatine of Naboo (Ian McDiarmid) and apprentice to the Sith Lord, Darth Maul (Ray Park). Many adventures await these dynamic characters and the audience alike. In my own movie viewing habits, I generally shy away from movies that feature kids or absurdly slapstick characters. As I had read the advance press of The Phantom Menace in 1999, I saw that it was to feature both. When I saw the completed movie, I was pleased that the story of Anakin Skywalker was not too overly central to this episode (aside from his just-barely believable piloting abilities), keeping his role in perspective. On the other hand, the Jar Jar Binks character... well, I have to admit I was on the edge of the crowd that disliked him and even felt that he damaged the film's watchability. After viewing again now, on DVD, I have not necessarily embraced Jar Jar, but I do think his character is probably second only to Liam Neeson's Qui-Jon Jinn in benefiting from the transfer to the small screen. Perhaps the real weakness of the movie is the casting; these actors just seem less charming than the motley crew of the original Star Wars (now Episode IV). Portman and Lloyd as the youngsters have difficult parts that are compounded by the nature of the filmmaking (i.e. countless blue screen sequences). They often come off as stiff and unnatural, particularly when interacting with each other, and especially when surrounded by so many expressive "creatures." Otherwise, the acting is of quality, with Neeson a particular standout as Qui-Jon; his serenity and potency does a great deal to move the story along. MacGregor's role as Obi-Wan is limited here, but he does have some effective scenes, particularly in his light-saber fights. Neeson, a veteran of other sword epics like Rob Roy, also does well in these sequences. The creatures that populate these worlds are beautifully animated and hold up on the small screen completely. From the little bits featuring droids and other lifeforms to the extended live-action/digital interaction scenes, the work here is just an awesome accomplishment. Although a real person occasionally fills in for Jar Jar Binks (see the documentary and featurette for more info), for the most part he is a totally digital character, interacting directly with the human characters; rarely does this fail to convince. Watto (voice of Andrew Secombe), the parts dealer, is a totally digital character and is amazing in the complexity of his animation (although he is uncomfortably reminiscent of the bitter Jericho in Les Enfant du paradis). Other digital characters of note are Boss Nass (voice of Brian Blessed) and the pod racer, Sebulba (voice of Lewis Macleod.) Any scenes with the inimitable R2D2 and C-3PO are inevitably enjoyable. Of course, there are scenes in this DVD version that were never completed for the theatrical release that George Lucas has re-incorporated into the movie itself. These added sequences do not significantly alter the story as it was original presented, but they do add more color and, in one case, more solidity. There is a Complete Pod Race Grid Sequence that serves to introduce some of the many racers. When the group arrives at Coruscant, there is additional footage of an extensive fly around the city that is lovely animation. Finally, there is a meeting between Obi-Wan and Yoda. 'Nuff said. Ultimately, as has been emphasized by representatives of Lucasfilm, this movie will have to be judged in the context of the whole saga—once completed—as the first episode. The next episode of Star Wars is due in the summer of 2002 and it has been indicated that the DVD release will follow shortly. If one was to imagine that Episode III will appear in 2005, then it is likely that one will not be able to view the series on DVD, in its entirety, before 2006 or 2007, if then. Image Transfer Review: Right up front, representatives of Lucasfilm, THX and ILM were unanimously proud of the image transfer for The Phantom Menace. The director chose to make this transfer from the film source, rather than digital files, stating that it needs to fit into the context of all six movies (when they, too, come to the format!) One of the factors that guided this decision was the goal of avoiding the "digital" look of a movie like A Bug's Life. This transfer is gorgeous in consistency, quality and color. There is so much information packing every frame, and it is amazing to see every vivid detail, especially those moments that are absolutely breath-taking in their complexity. With so much going on, it may be possible to miss minor imperfections, but on my system, I detected no major edge enhancement, pixelation, color bleeds or any of the usual suspects. While not disturbingly so, there are scenes that do look "digital" and there are some special effects that do not mesh as seamlessly as others, but only under scrutiny. Fleshtones are, shall we say, the colors they should be, and black levels are absolute. It goes without saying there is nary a scratch or nick; the image is superior in everyway. No doubt, this will be the new standard you'll pull off the shelf when you want to show the DVD-uninitiated the capabilities of the medium. The set comes with THX optimizing capabilities that enable you to calibrate your system for sound and video quality. Paper glasses, similar to the old 3-D glasses, are included to use in one of the tests. More information about this can be obtained at the THX web site. Audio Transfer Review: The Phantom Menace comes with a Dolby 5.1 Surround EX soundtrack in English, as well as Dolby 2.0 Surround in English and Spanish (French on the Canadian version). The 5.1 track gave my system the workout that it has been demanding. Pod Race. Pod Race. Pod Race: the sound design is truly incredible in this sequence. In the same way that Lucas worried that the potency of this dynamic sequence would overwhelm the rest of the movie, I admit that sitting at home with the pods blasting around me, I felt similarly. But, in the Lucas style, the first part of the film is like a little episode on its own and I did not mind the political interlude at Coruscant that lead to the final aural assault of the retaking of Naboo. THX Sound Designer Rick Dean has said the team was "very interested in maintaining the original sound design." I believe they have, with natural details emitting from every corner. The EX does play properly on 5.1 sytems; all of the sound information is there, it is just doesn't split off if you do not have the 6th speaker. Similarly, in my examination of both 2.0 tracks, the enhanced stereo was jumping and the quality was excellent, if minorly degraded. Although the action sequences will probably get most of the notice, fantastic work went into creating ambient sounds of various types and nothing seems appears to have been lost. Other areas that certainly deserve special attention are the light-saber fights and the attack on the droid control ship. And the same great care has been taken with the completed scenes (included on disc two) as they have comparable sound quality to the feature itself. And doggonnit, even the audio commentary is stereo! Extras Review: The Phantom Menace is one well-stacked disc of extras. With hardly a false note and despite some duplication of material in the various featurettes and documentaries, the added material expands our enjoyment of the movie in many directions. Very much up front is the technical achievement in digital movie-making that this film represents. There are also in depth views of costume, design, animation, fighting techniques, characterization, acting and more. The goal as stated by the creators of the disc was to include extras that people will "actually use." The disc does a fine job of straddling the fine line between being a treasure for the Star Wars fan and interesting for the more casual movie fan. There is a great deal of material that would interest anyone who loves movies and knowing they ways they are made. Menu System: Van Ling has created a stunning menu design. Intended to be more than just disc navigation, the system utilizes random elements to control what look appears when the disc is inserted. The menu system can feature scenes from one of the three planets portrayed in the movie: Naboo, Coruscant or Tatooine. The extensive animations are entertaining but can become somewhat cumbersome in quickly navigating the screens. Audio Commentary: Very good commentary throughout by the key figures of the technical side of the film. The different contributors were recorded at different places while watching the film and the results were edited together. There is great contrast between Lucas' overall vision for the series and the justifiably proud comments of the effects guys pointing out particular achievements and difficult scenes. The commentary is filled with anecdotes, historical bits and other notes. There is indeed some discussion by Lucas on the deeper themes of the double trilogy and potential developments in the story line for the two upcoming episodes. Also revealed are the scenes that were re-incorporated into the film to make this new version for DVD. Visual effects supervisor Pablo Helman, who worked on the completed scenes, that in one of the pod racer introductions in the Complete Podrace Grid Sequence, he had the character flipping through a technical manual and then tossing it away. At this point, in viewing the resulting scene, George Lucas stopped the tape and supposedly said, "In the Star Wars universe, there are no books." So, a laptop was substituted instead. The Beginning: Making Episode I (01h:6m:10s): Documentary filmmaker Jon Shenk was hired to take over the process of documenting the making of The Phantom Menace. He shot over 600 hours of film and many parts were used in making the featurettes that have appeared previously on the Internet and now, on this disc. He was asked to come back and make a new one-hour documentary from that material. This is a very entertaining and enlightening bit of film that serves as a kind of overview of the other supplemental material included here. All together, these extras tell you more than you ever thought you wanted to know about the Star Wars. Bad Droid Karma (5m:32s) - Will the real R2D2 please stop falling down? Multi-angle storyboard and animatics:This is certainly a prize extra for its interest and uniqueness. It is an excellent companion to the extensive technical explanation provided in the various featurettes and documentaries. There are three parts: First is a brief Introduction to Animatics that explains how this tool is used to bridge the gap in the development process from storyboard to final film. It also demonstrates the amazing fidelity that is achieved in the finished product from the original vision. Nice little workout for your multiple angle button. Duel of the Fates music video (4m:13s): The video is part trailer, part film clips, part making-of documentary, along with John Williams and the London Symphony Orchestra—all in a four-minute package. This is a very enjoyable video and a worthy souvenir, very effective in showcasing the elements that makes The Phantom Menace visually exciting. It did, however, make me wonder how long I was going to hear choral Sanskrit chanting in my head. Production Photo Gallery: Utilizing a very nice feature that allows us to show and hide the well-written captions, here we see a collection of 75 high-quality production stills, which serves as a nice compliment to the documentary materials. Theatrical Posters: The teaser poster, featuring Anakin Skywalker casting the shadow of Darth Vader, in two versions, with details and the release poster in 16 of the 32 languages for movie theaters around the world. It is interesting to see the same familiar image for The Phantom Menace in so many disparate languages and recognize the physical evidence of the international appeal of the film. Print Campaign: As we see from various marketing materials preserved on this disc, The Phantom Menace was marketed differently to the international audience than the domestic audience. It seems that the thrust of American marketing was the "action" aspect of the film, whereas, internationally, it was portrayed more dramatically—and poetically. The Tone Poems were meant for the International Market and the stills in the print campaign build and expand on the "One" theme found in the poems. We see 9 sets of images, each focusing on an individual character. Teaser Trailer (2m:3s) and Theatrical Trailer (2m:17s): There is no slacking here: these are the highest quality trailers I have ever seen and are very enjoyable watching. The theatrical trailer will make an excellent "check this out" bit to use when demonstrating a system to the Home Theater Uninitiated. It is interesting that the teaser focuses on Anakin Skywalker as the "Chosen One" of the Jedi, while the theatrical trailer virtually ignores him in favor of the action-oriented battle against the invasion of Navoo. The millions that made The Phantom Menace trailer the biggest Internet download in history will be pleased to have a pristine transfer on this DVD. TV Spots: The first group is five "Tone Poems" that examine various characters and themes in a short, poetic form emphasizing the "One" theme. The first, One Love, is a minute long and focuses on Anakin leaving home. The next two, One Dream and One Destiny, also focus on Anakin and are about 30 seconds each. The fourth, One Will, features Queen Amidahla and the fifth, One Truth, features both along with Darth Maul. The second group is labeled "Adventure" and features two 30-second clips, The Saga Begins and All Over Again, which are more traditional-style trailer material. Starfighter—The Making of A Game: This featurette is pretty much an ad for the video game and somehow slipped under the radar. Perhaps it would have been more interesting if it showed how the game was made, but this piece does not quite live up to high standards for "utility" that was established for the disc and may be worth one look. DVD-ROM weblink is designed for PCs running Windows 95 or better (sorry Mac Users, I guess in the Star Wars universe there are no Apple Computers). Ultimately, this link (available on several menu screens) will unlock exclusive Star Wars materials, available only to disc owners on the starwars.com web site. I don't believe there has ever been a more anticipated DVD released with such enormous expectations than this, The Phantom Menace. Star Wars is a phenomena far different than any other movie franchise. Lucasfilm has set out to pay tribute to their franchise by releasing it in a form that they, themselves, stop just short of calling "the best DVD ever released." In many ways, they achieve this famously and, although they coyly say that they "wanted to do the best job for the fans," this is certainly one of the best DVD packages to date. There is no doubt that I enjoyed The Phantom Menace DVD immensely and can easily recommend it as an essential disc for any DVD collector. With its stunning visuals, excellent sound design, rich characterizations and exciting action sequences, Star Wars: Episode I—The Phantom Menace comes so close to being a perfect piece of entertainment. And yes—there are scenes that were finished after the theatrical release and incorporated into the movie. Add a second disc that is packed with extras—including "deleted scenes" (completed scenes, some not appearing in either version), featurettes and documentaries galore, as well as dynamic demonstrations of animation technique—all I can say is: you must own the DVD. Besides all the fanfare, any movie with Yoda is a total delight. Here, while Yoda sightings are rare, they are significant meetings. Otherwise, the stability of the Republic is crumbling, Jedi Knights are fighting evil and a young boy named Anakin Skywalker, strong with the Force, moves toward his destiny. Waiting what for are you?